This notice is on the airing of a Jonathan Kozol interview — “US Apartheid Education & Flaws in NCLB” — will be repeated at midnight tonight on CSPAN’s BookTV program. 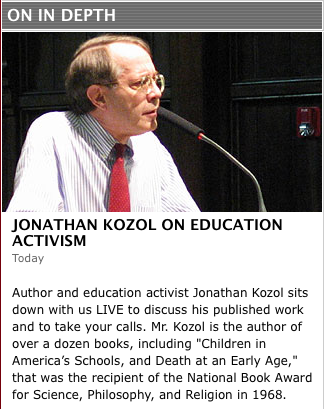 [Kozol] IS A SHARP CRITIC OF THE CLASS AND RACE BASED EDUCATION SYSTEM IN THE USA. He also challenges many of the “reform” policies such as the NCLB “teach to the test mania”, rote learning, Charter schools and vouchers. He is not afraid to take on Sec. Duncan and others who want to use a business model for education, blaming teachers and their unions , and replacing many experienced African American teachers with White “Kinderwonder” middle class recent Ivy League graduates who will only stay in teaching a few years as they have in New Orleans and Chicago, etc. He points out how KIPP and Green Dot charter schools cherry pick their elite students while leaving most other poor children in run- down Ghetto schools.